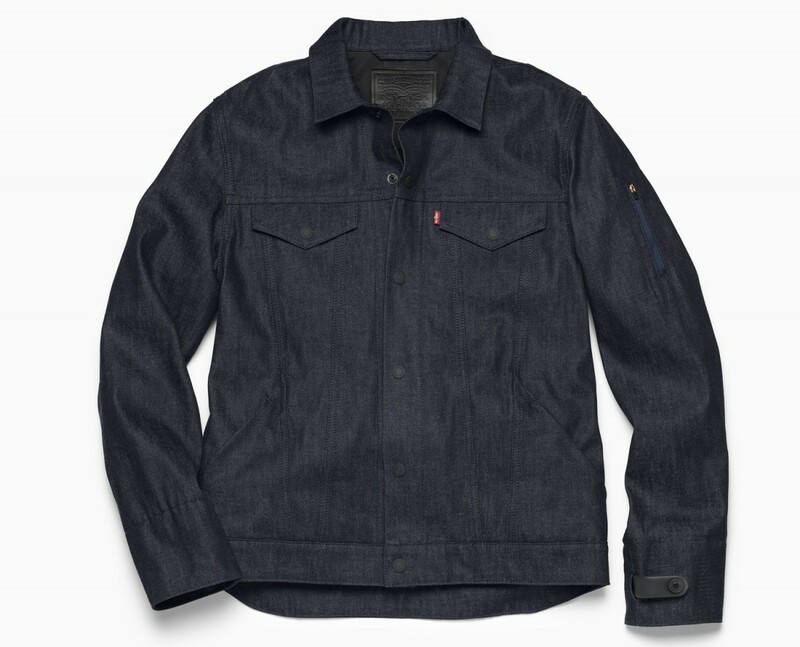 16 years after the Philips/Levi’s jacket, Levi’s have returned to electronic garments. Together with Google they have announced, at the recent Google I/O, a smart jacket for urban cyclists. The jacket uses the touch pad developed by Google’s project jacquard to enable gesture control of a bluetooth linked smart phone. In the following video an urban cyclist heading through San Francisco puts the jacket through its paces. Like in the original Philips/Levi’s jacket snaps are used to make an electrical connection between the electronics and fabric touch pad . This diagram illustrates that the gestures can have different meanings depending on which application is in focus. It is not clear how the focus is shifted, bur the basic functionality covered is: call handling, navigation and music. The electronics is clipped to the left cuff in this photo, I guess that is for use by a right handed person. I wonder if they will have it so it can be clipped to either the left or right side to accommodate left handers. The jacket goes into beta testing in fall, followed by a spring 2017 release. It will be great to see such a product in the market and hopefully, the touch pads become easily accessible for a broader community to innovate around.